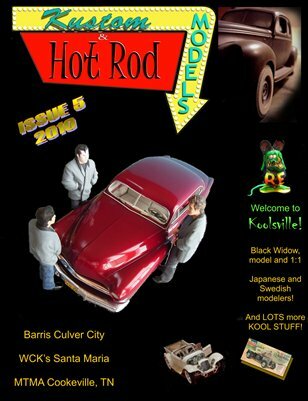 Here we go with Issue #5 for all you kool katz out there! This is the alternate front cover B. More kool stuff for you to gaze your orbs upon! International modelers also! With this issue, we also have a choice of two covers A and B, check both of them out! The inside of the magazine is the same, only the front covers are different. Also, don't forget to sign up on Magcloud to follow the magazine, if you haven't already. In this way, the publisher can send you a message when there is news about the magazine, such as the new issue being available or other nooze. Make sure you check the box to be notified instantly by email, otherwise you won't find the messages until you come back to Magcloud. If you don't sign up at all, you may miss issues of this popular magazine. Also, note that the special Extra #1 issue is currently available as a FREE DOWNLOAD for I-Pads ONLY. Note that Magcloud will now mail up to 300 pages worth ANYWHERE IN THE WORLD for one price! See Magcloud's details on shipping.